St. Peter’s, perhaps meeting old friends along the way. Many of the Redemptarists were there, such as the farmer John Sham of Johannesburg, now Father Nicolas, being ordained in England by Bishop Fellay on the 23rd of September 2000. There were some friendly Capuchin monk, with whom Br. 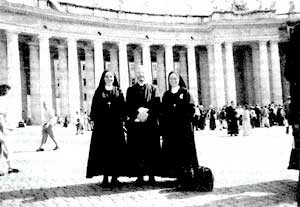 Seraphim Marie (Francis Poverello) now stays, as well as a Dominican monk from Canada wham I helped along the way to his own vocation and then there was Sr. Maria Campassiva, who had spent some months with us. Plus faithful from around the world. It was now 2:30 pm and time to repeat what we did at St. Paul’s, but having learnt the routine, everyone quickly fell into line when the chants started over the PA system. Entering into St. Peter’s was an extraordinary sight with the long procession (now well over 4,000) seeming to stretch on and on. It might be asked how come we did not meet opposition in entering these Basilicas, where we had the candles on the high altars lit for our prayers and the use of the microphones? In fact, the Society had applied for our pilgrimage more than a year ago and after going through many Cardinals, the Jubilee Commission granted its approval, perhaps because it would have been a bigger scandal for them if we had arrived at the Holy Doors only to be locked out. In St. Peter’s we gathered around the Confession of St. Peter and though there was still room in the side aisles and behind the altar, we seemed to fill the nave of this great Basilica. Here in South Africa where a huge congregation would be 250, to hear nearly 5,000 singing and praying in such a Basilica is certainly moving. Here Bishop Fellay preached and then Fr. Schmidberger also at the tomb of our Patron St. Pius X, whom we thanked for his constant intercession for the Society and the Church. Day 2. This day began at the Basilica of St, John Lateran, with the same order of processing in with Latin chants and the Rosary. Here, as well a as on the way to St. Mary Major, the next Basilica we would visit, I had the honour of being the assistant to the cross which led the way into St. John Lateran, and then immediately out through the side transept to process up the Via Merulana which leads directly to St. Mary Major about one and a half kilometers away. The police had just that morning given approval for us to process up the avenue itself and so after a little time to get everyone 16 abreast we set out, chanting at the top of our voices the Lauda Sion. St, Mary Major is one of the smaller Basilicas though the greatest of Our Lady’s churches, so the pilgrims could not all fit into the church at once. In fact we filled it twice with now over 5,000 pilgrims. We were told by the Jubilee Commission that we had the biggest pilgrimage this year, at least into St. Mary Major. From here after the 2 hours it took for all the pilgrims to enter, we processed out and went a few hundred metres to a park on the Colle Oppio near the Colosseum, where we had lunch, and a 4:30 pm a Pontifical High Mass celebrated by Bishop Fellay. A Monsignor Conte from the Vatican had accompanied us to the 4 Basilicas and was very impressed. He thought that perhaps not all these pilgrims were so fervent, as is often the case, the ones at the back amusing themselves rather than following the prayers. So he went out to the very back of the pilgrims to find that they were singing and praying just as loud and fervently as those in the front. Even the chief of the Carbinieri (police), had to remark that he had not seen such a religious pilgrimage in Rome. Day 3. This was the traditional visit of the 7 Basilicas of Rome, the 4 already mentioned and 3 others, namely, St. Lawrence Outside the Walls, Sancta Cruce and St. Sebastian in the Catacombs. This visit and prayer at each requires a walk of some 23 kilometres, and so only the heartier sort went forth, beginning at St. Mary Major at 9:00 am and ending at St. Peter’s at 6:00 pm, having successfully dodged all the traffic in the streets of Rome and keeping; in sight the group in front of you, whom you hoped knew where they were going. Something over 1,000 pilgrims set out, and not having a group of my own I joined the Irish, having changed colours for the day but not sides. Even so, among these there were some rather elderly pilgrims in their 60’s or more who didn’t miss a step or complain in the 30° plus temperature. What is a pilgrimage without a little penance? Many thanks are due to Bishop Fellay for bringing the Society to Rome for such a pilgrimage and thanks to all who worked to organise it, especially the Italian District. Such a pilgrimage is surely the fruit of the True Mass and in this the a expectation of many blessings from heaven on Tradition and the Church. We look forward to the next one knowing that will be only another 25 years till the next Holy Year.